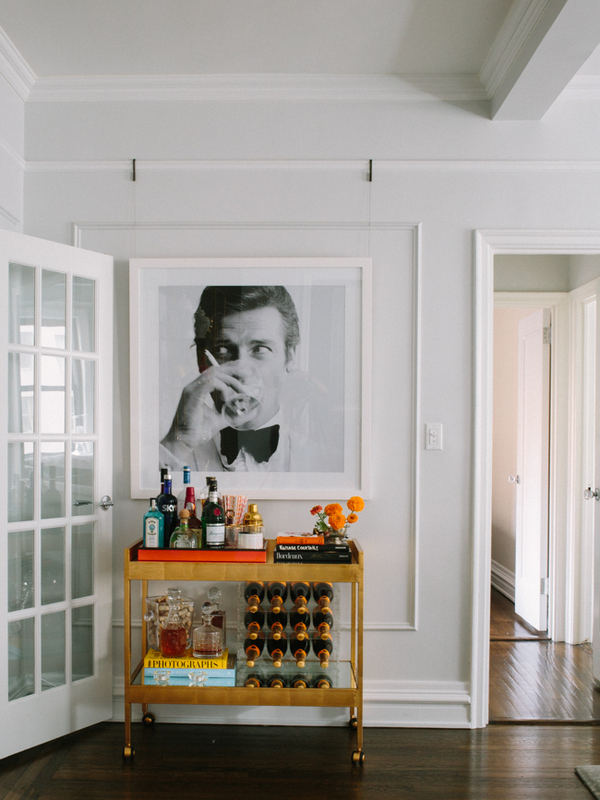 Before I moved into this apartment a little over two years ago I had always wanted a bar cart to style. My mom actually gifted us this one and I immediately got to work on how I wanted to style it. I will have to give my husband credit here - he took quite an interest in how to display our decanters AND he took the champagne to another level - literally! I had initially started out with two racks of the Veuve but he took it to three! I thought it would be fun to incorporate cocktail books on the top shelf since they are smaller than the average coffee table book. Keeping the liquor on the tray to the left, I styled the right not only with the two books but with a fun bowl filled with matchbooks from our favorite restaurants and or special places we have been. I also have displayed ( I will admit I have never used) these cocktail napkins that have come to be a favorite go to house warming gift of mine. I LOVE the fact that they are all animal themed and have the wittiest lines. If you look close i have another little animal peaking out - it's a gold bunny bottle opener. Also on the top shelf nestled in with the bottles, are fun party straws that look very cute displayed or actually in a cocktail! Anthropologie has fantastic glasses, plates and anything home - that's where I got the gold rimmed glasses. The gold shaker I thought was a fun twist on your average silver one and another piece to display that tied together the "cocktail" part of the cart. Back to the cart! As for the bottom shelf I found these super cool acrylic wine racks from CB2 - which I highly recommend for basically anything acrylic in your home if you do not want to spend a fortune ( we have these as well). Since the bottom shelf's main display is the champagne, I wanted to give a little color to the glass ice bucket and decanters so that the bottom shelf wasn't primarily gold and green. What is special about the yellow "Photographs" book is that the island we went to on the second leg of our honeymoon is featured. We have never come across anything mentioning Benguerra and this book did! After carefully choosing the decanters to put on the bottom, I thought it would be cool and to kind of tie in the collection of matchbooks - and fill the ice bucket with wine corks! 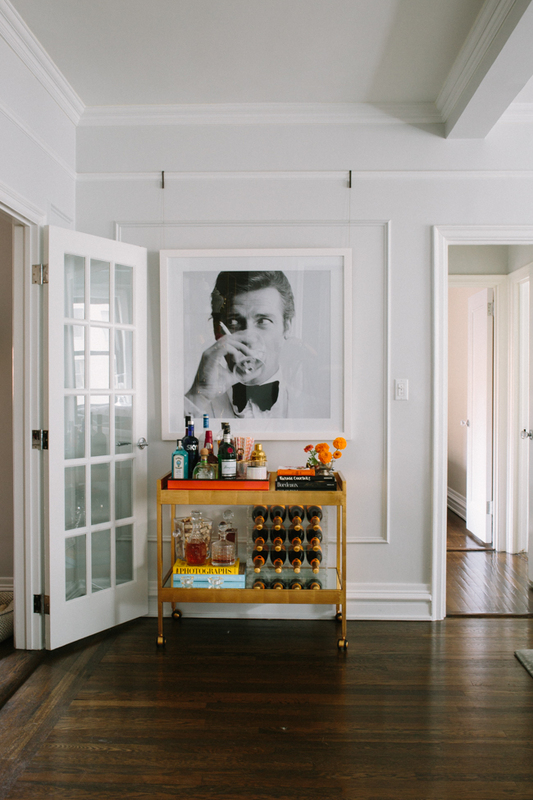 Another collection that has been built overtime made our bar cart a little more special. I have to say my most favorite thing about the bar cart isn't actually on it. It's above it! When I came across this photo of Roger Moore as James Bond, I knew it would be perfect for this space. I'm pretty obsessed with it! 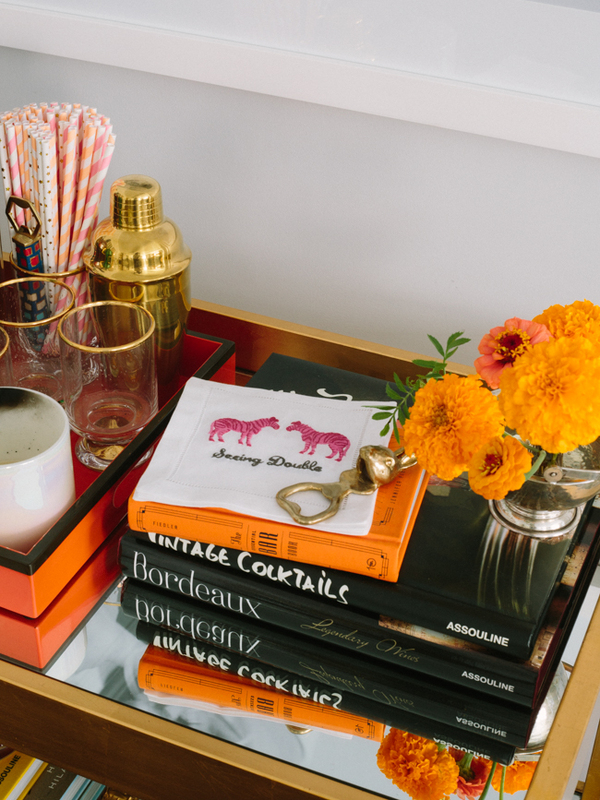 It's fairly easy to style a bar cart - get a great candle, some fun glasses and matches and work your way around these easy to find pieces and of course get together a few bottles of liquor and it will start to come together. I linked a bunch of pieces below to get you started!